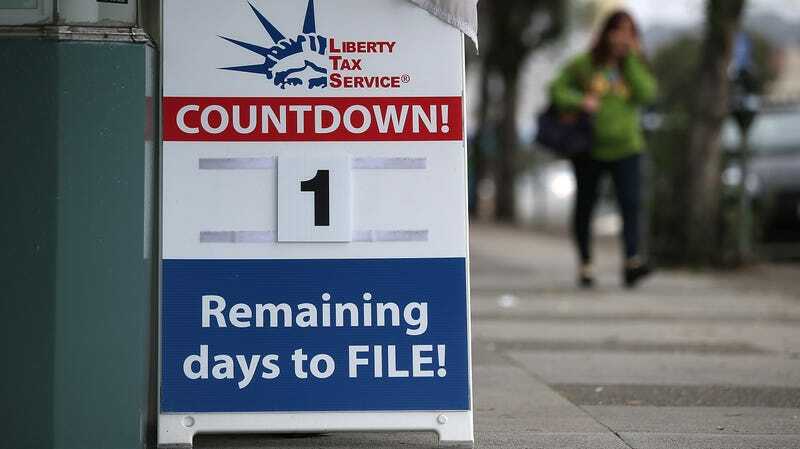 There’s a good chance that like millions of Americans, you’re currently procrastinating on filing your taxes despite the fact Tax Day is less than 48 hours away. That makes sense. After all, technology gave us e-filing, thereby enabling all of our worst impulses to leave this very important legal obligation to the absolute last second. Except these days, that’s all tech has given us when it comes to simplifying the whole tax process. The rest of it—deciphering tax laws, calculating deductions, etc.—is still a source of stress, anxiety, and lots of anguished hair pulling. The worst part is, it definitely doesn’t have to be this way. What you may not have known is the IRS could potentially create a free, online filing system that requires you to do exactly nothing each year because the government would prepare your taxes for you. Those annoying W-2 forms your company mails you? They’re also obligated to send a copy to the IRS. Same goes for investment tax forms, 1099s, and all that other official paperwork. Basically, the IRS could potentially use the miracle of technology to pre-fill out your taxes, send them to you online, and you’d have the option to just go with it or file your own adjustments. ProPublica initially reported in 2013 that the major reason we don’t already have this is because for-profit tax preparation services—including Intuit, maker of TurboTax, and H&R Block—have aggressively lobbied against it. Earlier this week, ProPublica followed up with a report about a bipartisan bill could also make it illegal for the IRS to ever do so that’s gaining steam thanks to lobbying by the cursed tax prep industry. I have lived this free, zero effort tax life—it just wasn’t in America. My first paying job was in Japan, which employs a withholding tax system. If you’re gainfully employed, your company just deducts however much you’re supposed to pay and files for you. In fact, most people get a postcard from the Japanese equivalent of the IRS in spring that shows them how much they earned, how much they owe, and how much was withheld. Any adjustments just automatically show up in your paystub at the end of the fiscal year. It took a minute and a calculator to check the government math, and in the three years I earned a salary in Tokyo, it was never wrong. Sure, I griped about having to pay taxes, but the actual process was seamless. That’s to say nothing of malware that’s aimed at stealing tax documents so that hackers can cash in on fraudulent returns. Or, apparently, the massive backlog facing the IRS in the aftermath of the government shutdown. The IRS is a notoriously underfunded agency, and the idea that it’s trying to process everyone’s taxes, plus deal with hackers on antiquated tech is terrifying. In the late 1950s, the IRS adopted IBM’s mainframe computers and like magic, the number of audits required dropped. Using computers eventually led to more accurate returns, and the ability to store data let the IRS build algorithms to efficiently detect error-prone or suspect returns. This makes complete sense to anyone who’s ever used a calculator. When I returned to the U.S., my accountant mother made me file all my returns by hand and calculate everything using pen and paper. She of course rechecked all my math and to no one’s surprise, my math was always riddled with errors. I nearly cried at the convenience of e-filing for the first time. The thing is, outdated technology isn’t much better. While those hefty supercomputers were brand spanking new in the ‘60s, it’d be absurd if the IRS still used those mainframes today. That’s why the reality of the IRS’s situation is horrifying. According to the Wall Street Journal, the IRS relies on outdated programming languages and antiquated equipment. In fact, the IRS’s computing systems are the oldest currently used by the federal government, and the number of programmers who can keep this system from falling apart keeps dropping. In 2019, it is absolutely idiotic that I can use my smartphone to buy all my groceries, socialize with friends, schedule my dog’s haircut, and invest in stocks, but the IRS doesn’t have up-to-date computers and code to, oh, I dunno, properly handle all the tax revenue for the entire federal government or, fend off the approximately 1.4 billion cyberattacks the agency receives per year. However, modernizing the IRS’s aging IT systems will take time and cost a lot of money. Earlier on Wednesday, IRS Commissioner Charles Rettig told the Senate the agency would need somewhere between $2.3-2.7 billion over the next six years to upgrade its systems—starting with a $290 million request for the fiscal 2020 budget alone. So while there isn’t much the average joe can do to fix this, maybe when you’re filing your taxes next year, consider not using TurboTax—even if it’s less convenient. You could always hire a human accountant, or if you make under $66,000 per year, take advantage of the IRS’s FreeFile system. (Those of you who make more can also use the IRS’s FreeFile fillable forms.) At the very least, cut the IRS a break and raise an angry fist at the people who really deserve it.